Lori Cheek had never been more nervous in her life. She walked down the low-lit, shark-lined hallway and into a stare-down with the five harshest investors in the world. Determined to take her business idea to the next level, she told them her invention would change the population. “You’re delusional. I’m out,” said Dallas Mavericks owner Mark Cuban. “Quit this hobby and shoot it like a rabid dog,” said billionaire investor Kevin O’Leary. “Trust that you’ll see me again,” said the determined entrepreneur as she was quickly dismissed from the bright lights of the Shark Tank stage. Lori didn’t let her dream die there. While she headed home without a business deal, she was armed with a renewed commitment to building her startup. Immediately following the airing of the show, Cheekd.com received a record-breaking 100,000 unique visitors and Lori’s inbox filled with thousands of emails insisting that the “Sharks” were out of their minds. Investors made offers and Lori found the capital she needed to create the technology that now powers Cheekd. The idea for the business came to her back in 2008 while out to dinner with an architectural colleague. He’d spotted an attractive woman at a nearby table, scrawled “Want to have dinner?” on the back of his business card, and slipped it to her as they were leaving the restaurant. While he left with a date, Lori left with an idea. For two years she brainstormed how to remove the business out of the business card and create a way for people to make modern-day connections. 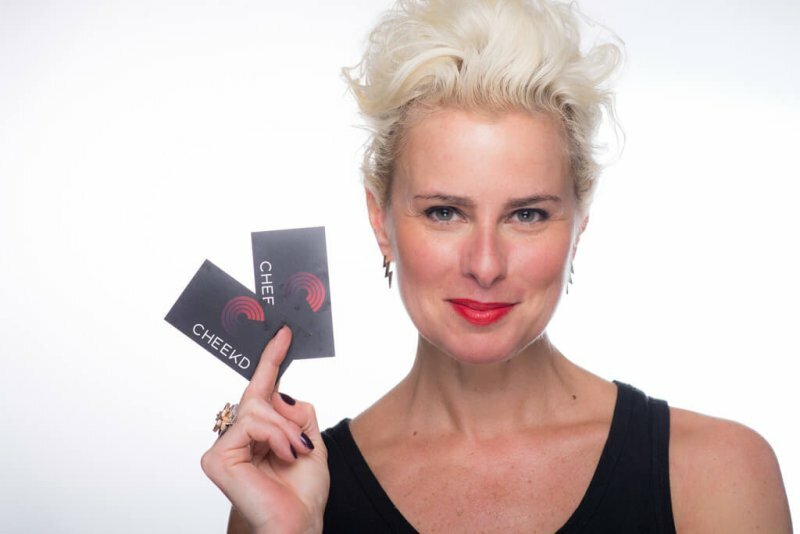 Cheekd.com began as a deck of ice-breaking dating cards with a unique code that lead the recipient to the privacy-protected online dating profile of the mysterious stranger who slipped them the card. Now a mobile dating app with bluetooth technology, Cheekd sends users an immediate notification when someone within their criteria comes within a 30-foot radius of them. Though she admits that men still dominate the entrepreneurial world, Lori acknowledges the strides women are making and the invaluable support they give to one another. “NYC’s startup scene is booming and there’s never been a better time to be an entrepreneur,” Lori says. If you’re a female in the startup world, “it’s easy to stand out at events and you never have to wait in line for the restroom,” she laughs. Her strongest advice to fellow female entrepreneurs? Take the leap if you truly believe in your idea, give up your excuses and doubt, surround yourself with a trusted and talented team, bulldoze forward, and don’t look back. New York recently ranked No. 3 on Lendio’s 2018 Top 10 Best States for Small Business Lending. Read more about why the Empire State is such a thriving hub for small business.